In situ decomposition of senescent leaves of twoabundant mangrove species (Rhizophora mucronataLamarck and Ceriops tagal (Perr) C.B. 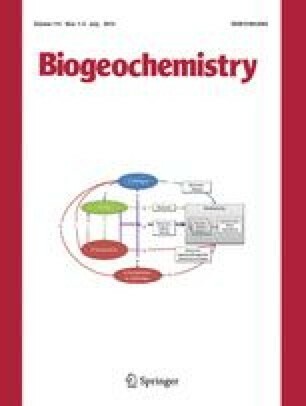 Rob),enrichment of nitrogen and activity of dinitrogenfixing bacteria during decomposition were investigatedduring both rainy and dry seasons in a tropicalcoastal lagoon (Gazi, Kenya). Rates of leafdecomposition were higher for R. mucronata thanfor C. tagal and were highest, for both species,during rainy season. Rates of decomposition, expressedas percentage dry mass loss, over a decompositionperiod of 50 days was: C. tagal (rainy season),69%; C. tagal (dry season), 27%; R.mucronata (rainy season), 98%; and R.mucronata (dry season), 48%. High rainfall anddiurnal tidal inundation appear to enhance the leafdecomposition process. Maximum rates of nitrogenfixation were 380 nmol N2 h-1 g-1 dw forC. tagal (rainy season), 78 nmolN2 h-1 g-1 dw for C. tagal (dryseason), 390 nmol N2 h-1 g-1 dw for R. mucronata (rainy season) and 189 nmolN2 h-1 g-1 dw for R. mucronata (dry season). Although N2 fixation rates werehighest during rainy season, total nitrogenimmobilised in the leaves was highest during the dryseason. Biological nitrogen fixation can account forbetween 13 to 21% of the maximum nitrogen immobilisedin the decaying mangrove leaves. Nitrogen fixation, asa source of allochthonous nitrogen, sustains anitrogen input to the mangrove ecosystem, which addssignificantly to the nitrogen input through leaflitterfall.